Definition: The Job Analysis is a systematic process of gathering complete information about the job duties and responsibilities required to perform a specific job. The job analysis is concerned only with the job and not with the job holders, but however, the information about the job is gathered from the incumbents. Redesign the job in a particular department. Once the objective is selected, it should be well communicated to the top management because with its support only, the changes can be made in the organization. 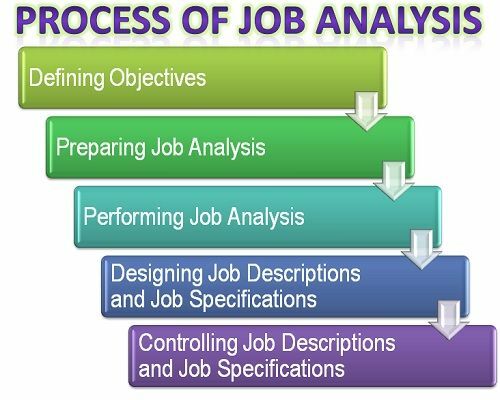 Preparing the job Analysis: After setting an objective, the kind of jobs that are to be analyzed are selected, whether the clerical jobs, managerial jobs, division specific job, etc. Also, the members who are included in the analysis and the methods to be used are identified.At this stage, the complete review of the existing job description is done to have a fair insight of the duties, responsibilities, organization chart, working conditions, hazards, etc. that exist in a particular set of jobs. Performing the Job Analysis: The next stage in the process of job analysis is to perform or begin with the job analysis. Here, the sufficient time should be allotted for collecting the job details from the employees. The information from the employees can be collected through questionnaires, interviews, or through an observation method. Once the information gets collected it needs to be sorted on the basis of its nature, division, department. Designing Job Descriptions and Job Specifications: At this stage, the job analyst prepares a draft of the job description and the specifications. After sorting of the information, the changes that need to be made in the jobs is identified and is written on paper. Once the draft gets prepared, it is circulated to the managers, supervisors, and the employees. Control Job Descriptions and Job Specifications: This is the last step in the process of job analysis wherein the job descriptions, and the specifications are timely checked and modified according to the changing needs of the organization. The job analysis results in the job description and the job specification. The Job description comprises of job duties, the level of responsibilities, working conditions, etc. and whereas the job specification tells about the skills, education, background, qualification, training, communication skills required to perform a specific job.